DENVER — The last chartered flight of the season lifted off Thursday evening to take the beaten-down Phillies home for three final games. Their late-season collapse continued with a 5-3 loss to the Rockies. Finlly, the end is near. Three more games and then the real challenge begins. The Phillies, for the first time since they signed Jim Thome, will enter an offseason with the feeling that they must sign a superstar free-agent. Matt Klentak said Wednesday that the free-agent classes in 2019 and 2020 are also primed with talent. But it would be discouraging if the Phillies whiffed this winter with the likes of Bryce Harper and Manny Machado. The Phillies, as 76ers coach Brett Brown would say, are star-hunting. The Phillies will go hunting with about as much money — if not more — than any other team in baseball. And it will be two of their biggest names — Rhys Hoskins and Jake Arrieta — who could help land that star. "Well, we're not far away. I think that's pretty obvious," Arrieta said when asked if the Phillies would be an easy sell to free agents. "There's some good ones out there that could definitely add to our ability to win ball games on a consistent basis, night in and night out. I'll talk to guys. From afar, I'm pretty sure most of them are aware of what we're capable of with the group here, and if certain guys are added to this mix, things look pretty bright for us." Hoskins and Arrieta are both represented by Scott Boras, who also happens to be the agent for Harper. Arrieta said he has talked "a little bit" to some fellow Boras clients about playing in Philadelphia. The serious conversations, he said, will come in the next couple weeks. "I want to win," Arrieta said. "Any way we can get better in any area I would like to be a part of helping that come to fruition if I'm able to." Harper and Hoskins hit it off this summer at the Home Run Derby. They bro-hugged on the field at Citizens Bank Park earlier this month while the infield was being blowtorched. 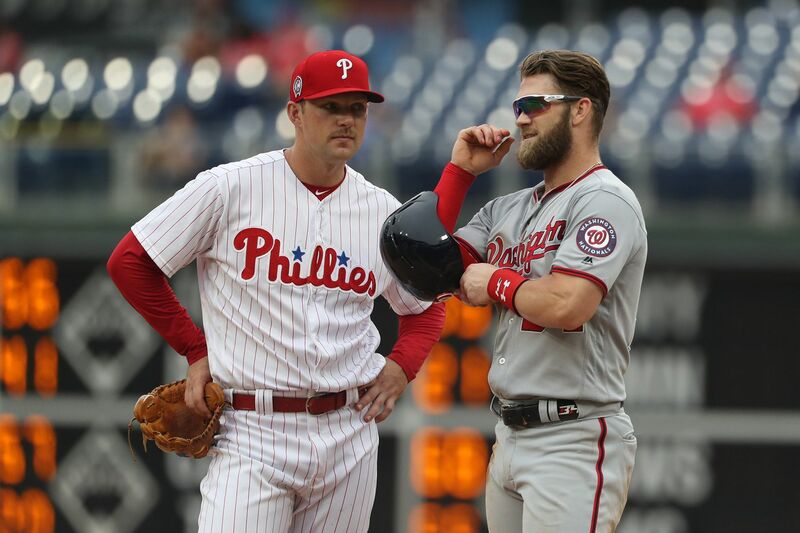 The Phillies will go heavy this offseason after Harper and it is plausible that Harper could reach out to Hoskins once the Phillies make him an offer. And what would Hoskins say if a free agent called him this winter to talk about the Phillies? "I think, first and foremost, I would focus on the guys that are in this clubhouse," Hoskins said. "I said it before, I said it from the start, I think there's a lot of talent in here. A lot, a lot of talent. And we're young. "I think if you look at the progress that was made from where we were at last year throughout all of this year, I don't think there's any reason to think that that's not going to happen again next year. The type of competitors we have in this clubhouse, we're only going to get better. "If a free agent is looking to be a part of it, I think that's exciting. You get a chance to be a part of a turnaround from where this organization has been the last four or five years to something that could potentially be really exciting for a good period of a time. I think as an athlete, a competitor, I'd want to be a part of that. Especially in a sports town like Philadelphia. Like that's exciting. You can't spin it any other way. I think it explains itself." The team's season-ending collapse has been brutal. The Phillies will likely end the season with a losing record, even though they were 15 games over .500 on Aug. 15. The epic collapse is something that will enter the minds of free agents, but those thoughts can likely be quelled by the terms of a contract. As bad as the final two months were, Arrieta said, the season cannot be considered a failure. "I think that it's unfortunate the way we've played the last couple of months, but if you view it as a failure, how does that bode well for us moving forward if we all look at it as we failed?" Arrieta said. "I think this season was a success for us in a lot of areas, and some other areas not as much. If we have in our minds that we were a failure then that's too negative for me." The season may not have been a failure. The Phillies, even by finishing with a losing record, outperformed expectations. They spent a good chunk of time in first place. They watched Hoskins and Aaron Nola emerge as cornerstones. All of that leads up to the next few months. The Phillies will board their next chartered flight in March, when they leave spring training for Philadelphia. And it will be hard to characterize the team's offseason as a success if a free-agent star is not on that plane.